Lust, Money & Murder is not a title I would ordinarily select, but the author requested reviews in exchange for the ARC. Lust, Money & Murder is really a teaser. It is part one of three parts that make up a complete book; therefore, this volume is short and didn’t take long to read. The author, Mike Wells, grabs the reader’s attention in the prologue, but then there is no connection with the rest of the story; perhaps that comes later. Some things are somewhat contradictory, such as this: Elaine looked down at it, unable to move. She abruptly rose. Later in the story, the man Elaine is falling for is somewhat cool toward her but then …. well, that changes abruptly, too. Lust, Money & Murder takes the reader through Elaine’s life from a little girl doted on by her father, to a coming-of-age young woman. She becomes super focused, though, on her libido, and does some crazy things for a crazier reason. Later, she applies herself to her future goal and becomes highly regarded in her chosen field – chosen for the purpose of revenge – through which she meets the rather secretive man she thinks she can truly love. Even though there are sections that could have been delved into more to extend the read, and the story could have benefited from more editing and development, Lust, Money & Murder is a good start. The groaner is the last line, which ended up being a cliffhanger mid-scene. (If you are tempted to get part one, please don’t spoil it for yourself by reading the end first!) The continuation is in book two, and since there are three parts it is likely the same thing happens at the end of book two as a lead-in to book three. Apparently, together they make one complete novel. 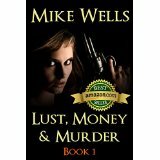 If you enjoy reading suspense, thrillers, espionage, you may enjoy Lust, Money & Murder, book 1, by Mike Wells, and want to purchase books 2 and 3 to continue the story. You can find Lust, Money & Murder, book 1 listed on my BUY THE BOOK! page. This entry was posted in Mostly About Reading, Reviews & Interviews and tagged adult fiction, Book review, espionage, Lust Money & Murder: book 1, Mike Wells, suspense novel, thriller. Bookmark the permalink. It’s not a bad story … a good way to get into a whole book.